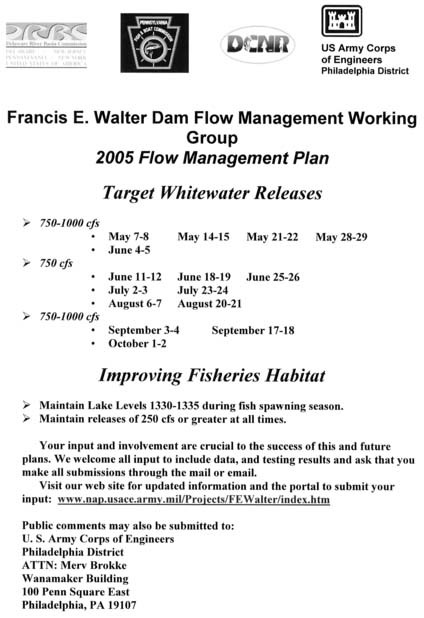 New flow plan for 2005 is pasted to the right. This is the plan the Agencies came up with and presented to the crowd of interested stakeholders on Thursday at Split Rock Lodge. As you can see - Whitewater Weekends are about tripled...last year there were 5 - but mother nature actually greatly increased this number since the Lehigh was running well over 'Whitewater Release cfs releases' most of the year. So these numbers are just targets. It is definitely great news to see an increased amount of water being released, even if it means tough going for the wade fisherman. The 250cfs minimum is also good to see. Remember, this is just a start and it looks like all the parties are really into doing the right thing for the river. We just hope this includes cold water...since right now the plan in place for 2005 does not give is much more of that. For 2006 we are going to stress the importance of this. Look for little black stones, midges and olives to be hatching on your local streams. 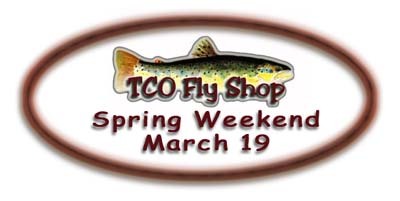 This time of year, an olive hatch can bring some fast dry fly action during the mid-day hours. Otherwise go underneath with a bugger or your favorite attractor nymph. Water flows are pretty good right with most streams running pretty clear. In fact the Susquehanna even has that limestone blueish-green look to it. Lehigh River portion. Scroll to page 3. PHILADELPHIA ( Feb 8, 2005 ) --- The Corps of Engineers, in partnership with the Pennsylvania Fish and Boat Commission, Department of Conservation and Natural Resources, and Delaware River Basin Commission announce today that they have begun the process to explore potential recreational enhancements along the Lehigh River and will conduct a public information workshop facilitated by the Wildlands Conservancy Feb. 24, at the Split Rock Lodge, One Lake Drive, Lake Harmony, Pa. from 7:00 pm to 9:00 pm. The next step in this process is to enlist public participation by providing them historical information about the process, discussing long-term objectives for Francis E. Walter Dam flow management, proposing a short-term plan, and addressing the need for further study and analysis. At the heart of the process are the public and how its needs will influence future flow management decisions. The public is invited to attend the workshop that will include several formal presentations and then be followed by the opportunity to discuss the process with the Corps and its partners at their respective booths. The Corps and its partners will continue to encourage the public to participate in the process and provide us written comments through the mail or email via the project website which will be announced at the workshop. Prior to the information workshop, there will be a networking session from 6:30 pm until 7 pm. The information workshop will be held in the Galleria's Keystone Ballroom from 7 to 9 pm. The meeting is this week - we hope to see you there!!! Show your support for fishery!! When I posted the chart below I forgot to add the amount of storage broken down in gallons. It is quite evident the bulk of storage in FEW is at the top. 'At water levels not seen since the twin storms Connie and Diane in 1955, the damage was considerable, especially lower down the main stem of the Delaware between Easton and Trenton.' Read more about it here. Switching Gears...The local limestoners right now are running crystal clear. Every year about this time they do this as a result of a high percentage of the groundwater and seeps being locked up frozen. One stream I stopped and took a look at just the other day - was looking like an aquarium. The normal limestone chalky green was not there at all. Thus the fish were not to be found. Where do they go?!? Charted below are some pretty interesting numbers. The first item that jumps to out is the 1,417' elevation. When FEW is at this elevation - only 1/2 or 50% of Allotted Flood Storage Capacity is being utilized. It is really amazing that the level of FEW can rise more than 100' and not even use 50% of the Flood Storage. This demonstrates the potential depth that water - coldwater - can be released. Just think what this could do to the fishery. For some good data on what the reservoir looked like when Ivan rolled through, click on the graphic below. 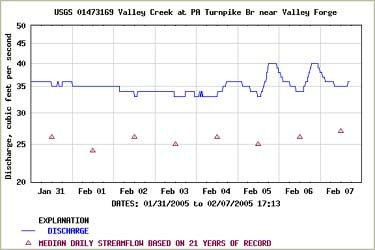 The chart to the right illustrates very well the effect of snowmelt on a stream. You can see it was right during the heat of the day when the water began to rise. This melt was a good one though since the overnight lows have been getting below freezing, allowing for things to ice back up overnight. The warm-up has also been gradual. Water temps are in the low-40s on Valley. Check out last year's action. This week we should get confirmation on a public forum - to be held by the Army Corps of Engineers - about future management of the Lehigh and FEW. If you fish, raft, reside in the watershed or just plain care about the Lehigh River, then this meeting is for you. Come out and share your views on how it should be managed - which we here at FFPA, llc feel is to its FULLEST POTENTIAL!!! Pun intended!!!! Support is what we need right now. For background materials - check out the links below. The DRBC completed this study back in August 2004 and is called Flow Strategy for the Delaware River. 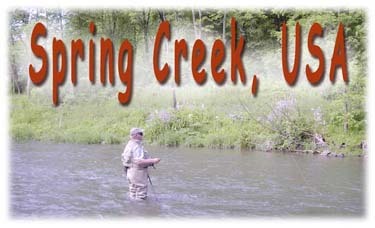 There is some great information about the Lehigh. We will be giving a Lehigh River Presentation. Come check it out.